Konin in western Poland had a Jewish community of 3000. In 1939 they vanished into history. Twenty-five years later Theo Richmond, whose parents moved from Konin to London before the 1st World War, set out to find them. This book is about my return journey to a place I had never been to, a place of which I knew nothing except that it was a part of my past and in a curiously powerful way a part of my present. Its name reverberated throughout my childhood and adult years, sometimes withdrawing into the far distance so that I scarcely heard its echoing whisper, sometimes clamorous in the bleak and desperate early hours, always there, somewhere in the caverns of the unconscious, refusing to let go. The name of that place is Konin. 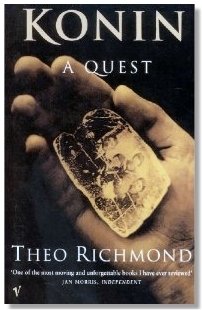 Publisher - Published in 1995 by HarperPress. Republished in 2009 by Vintage. A stunning achievement in literary journalism...a book that is a model of moral awareness, of tremendous humanity and compassion, a deep and powerful book about an unexceptional community that will take its place among the classics of the Holocaust literature...The central theme, of course, is the destruction of Jewish life by the Nazis. Before the war, Konin was a small country town, population about 12,000, in Polish territory but close to the German border...He deals with the horror of the Holocaust itself - the enormity of which tends to overwhelm and numb - by humanizing the experience, by attaching a face and a personality to the tattooed number...Mr. Richmond presents a dramatic, compelling narrative that reads like a 19th-century social novel...[His] vivid evocation of Jewish life in Konin centers on the bustling Tepper Marik (pot market), the Jewish market square, where vendors hawked their wares from stalls and carts...The justifiable pride of the entire community was the secular Jewish library (started clandestinely by the Bundists) that boasted over 5,000 books in 1922...Almost everyone he interviewed mentions the now-vanished library and its influence on his life. This page was added on 12 April 2008. Updated on 18 December 2010.